In the United States, wildfires might blaze on one coast while a Nor’easter rages on another. There are mountains and valleys, deserts and tropical shorelines. Thankfully, there are also beautiful outdoor environments perfectly suited to each of these extremes, with aesthetics to match. On the Northwestern coast, for instance, Lograsso says homeowners favor color palettes that are earthy and dark, compared to the tans and Sedona reds in the Southwest, or the light, fresh, coastal reef-inspired colors in the Southeast. With local geographies, climates, soil conditions, aesthetics, and flora in mind, let’s take a look at a few of these extreme regions across the country, tapping experts from each locale for ideas, instructions, and inspiration. 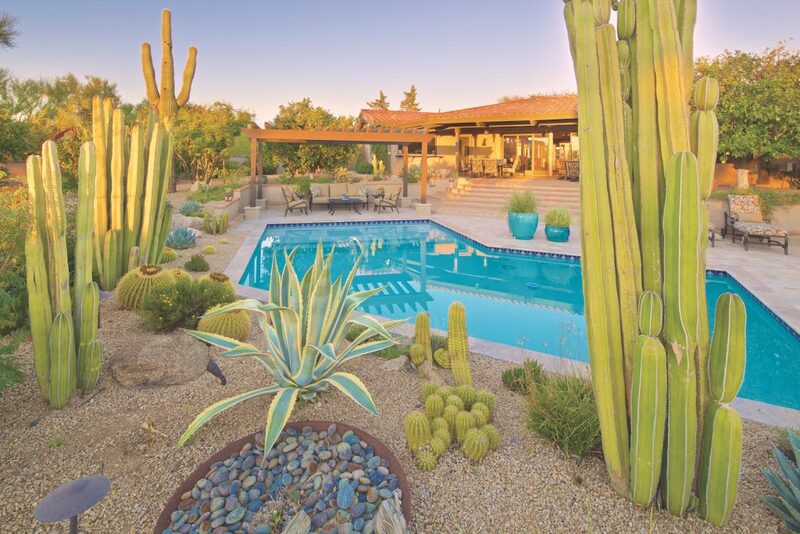 Working in the desert climate of Phoenix brings with it nearly daily sunshine, warm weather, and limited rain that clears up quickly, says Chris Griffin, EIT, SWD Master, and president of Unique Landscapes and Custom Pools in Phoenix. “In Arizona, one of our only challenging conditions is the extreme heat in the summertime. And we have a wide array of soil conditions,” Griffin says. 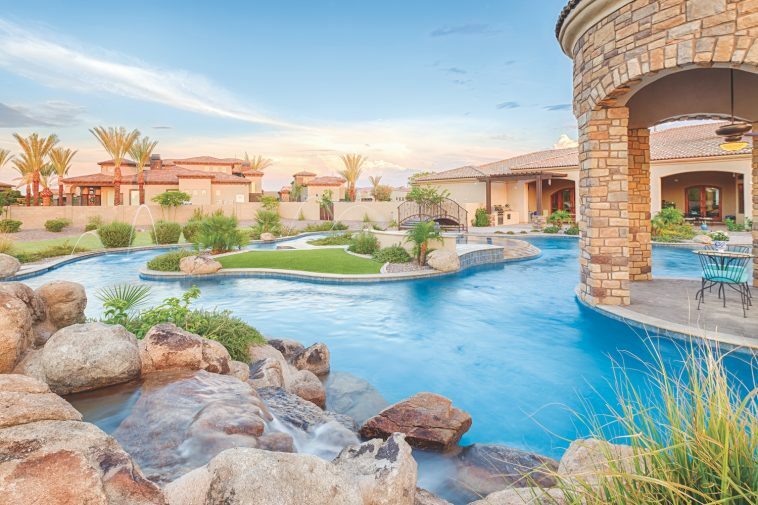 That heat impacts a variety of design decisions, from employing higher strength concretes in pools shells to using xeriscaping for creative, lush landscapes. For clients wanting a traditional Southwest-style landscape, Griffin uses elements such as concrete pavers, flagstone, and plants like agaves, succulents, and saguaro cactus for a “blooming desert” look. In fact, he says a lot of Arizona neighborhoods require native-style landscaping in the front yard. But peek behind those traditional-looking homes and you’ll often find backyards that belie the dry desert landscape, complete with pools, waterfalls, swim-up bars, and lazy rivers, not to mention green plants, lots of grass, hedges, and artificial turf that make the surroundings feel lush. Such projects often incorporate plants that aren’t traditionally southwestern but are still conducive the climate, like boxwoods, crepe myrtle trees, ficus trees, queen palms, and medjool date palms, to name a few. Gloucester, Massachusetts, with its dramatic granite cliffs plunging toward the ocean, is ruggedly beautiful. Emphasis on the word rugged. For landscape and hardscape designers, this equates to high salt winds, poor sandy or acidic soils, and sometimes multiple microclimates on the same property, plus sun, rain, snow, drought, and temperature extremes. “Environments like these really keep you on your toes. They can be both captivating and pretty hostile,” says Greg Bilowz of Sterling, Massachusetts-based Bilowz Associates, Inc., who’s worked on coastal properties for decades. That’s why Bilowz loves using granite hardscape elements. Many are local to coastal Massachusetts. They weather beautifully, reflect light in a lovely way, and have many different hues—plus they are softer on the feet and don’t get as hot as something like bluestone. He is currently working on a 14-person, ocean-side infinity-edge spa made of granite that has warm gray and buff pink tones with a soft-to-the-touch finish. When it comes to plant materials, Bilowz recommends native plants and other tough plant species that can withstand the elements, like mugo pine, Japanese black pines, lilacs, spirea, hydrangeas, and several rose varieties. He also likes using “windblown and wispy” ornamental trees, shrubs, and herbaceous plant materials. “The soft movement of beach grass on a breezy day is as calming as watching the ocean ebb and flow,” he says. With its clay soil, largely flat terrain, and mild winters, the humid subtropical climate of Atlanta is great for watershape and landscape designers like Juliet Wood, owner of Juliet Wood Design. “It’s very good for plants and also for people because they can enjoy their backyard,” she says. Although Wood says materials and plantings depend on the project, she frequently utilizes flagstone, bluestone, and pavers, as well as either native plants or ones that will adapt to the climate. “I always design for a specific space,” she says. For instance, one of her most recent projects was for clients who wanted to bring a bit of their native Lebanon into their backyard. Such a design was a good fit in the Southeast because, although Lebanon has a drier climate, “the temperature is very similar,” Wood says. The finished project includes a cabana, water features, hardscape, and landscape around a freeform pool with a mix of straight and curved lines and a rounded spa with a perimeter overflow. The space also boasts beautiful plant walls featuring a variety of vegetation like Thymus vulgaris, tunic flower, blue spruce, and Irish moss. A wide array of groundcover, evergreens, and tropical plants like elephant ears, ferns, and blue hosta adds to the atmosphere. The result is a lush, peaceful landscape with a lot of color and height. It’s an outdoor oasis that gives its owners a little feel of Lebanon in the American south. Upstate New York, Rhode Island, and Vermont are renowned for their beautiful scenery, but they also have very cold, snowy winters and warm summers. This is where Jamie Scott, owner of Group Works LLC, in Wilton, Connecticut, does a significant amount of his work. In these “freeze-thaw areas of the country,” says Scott, it’s important to choose harder, more durable stones that won’t be affected by freezing water. Happily, a lot of the best stones for those purposes are local to the area, like bluestone from the Catskill Mountain region and granite from New England. Those rocks are also in the region’s soil, making it great for drainage, adds Scott. One thing he approaches with caution, however, is glass tile in pool interiors, since frost can get in between the glass and thinset and pop off the tiles when the pool water freezes. “We in the Northeast have learned that using a glass tile in the interior is problematic, and that it takes special preparation and winter-time care,” he says. When it comes to landscaping, Scott prefers plants that are suited to the climate, or even southern perennials that, in the Northeast, become annuals. Tropical plants generally aren’t in style here, he notes. “It’s just not good manners to the neighborhood,” he says. Instead, Scott likes to use Japanese snowbell trees, Summer Wine ninebark shrubs, hemlock, and hydrangeas, as well as lots of pots around pools and outdoor spaces for added beauty and color. And in a place where mountain views are paramount, Scott often favors glass panels or taking advantage of grade changes in the landscape to install required fencing below the eye line and out of view.